Gale designed the gardens with the help of Back Meadow Farm, of Damariscotta, and it was her idea to use the dormer off Charlie’s office as a bunk room, furnished with beds from an unfinished furniture outlet. In fact, the Willauers had been thinking about that house for 25 years. They purchased 11 wooded acres above the meadow in the late ’80s and spent countless weekends camping there with their three boys. Later, they graduated to a primitive cabin, modeled after those at the Hurricane Island Outward Bound School, founded by Charlie’s dad. So when their neighbor offered to sell them the meadow in 2011, ensuring them an unobstructed view of the water, they took it as their cue. They traded their house in Duxbury, Massachusetts, for an apartment in Boston, where Charlie works, and started planning their Maine home. 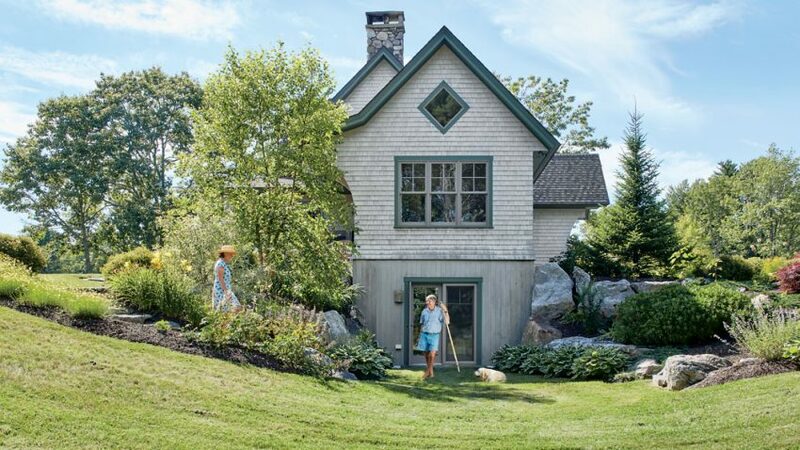 Perched on a meadow above the confluence of the Back and Cross rivers, the Willauers’ house borrows from two iconic Maine architectural styles ­— shingle cottage and farmhouse. The property’s old rock walls yielded the stones for the fireplace in the combined den/kitchen/dining room. Above the mantel is an oil painting by Charles Savage Homer Jr., Charlie Willauer’s great-great-grandfather (and Winslow Homer’s brother). The Willauers sourced several of the architectural details themselves. 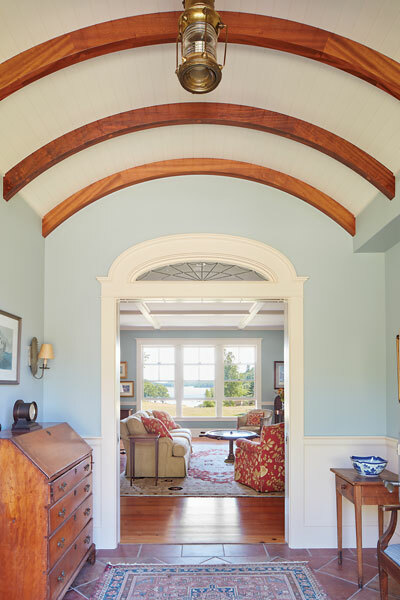 Gale found the ships knees that support the dining area’s ceiling beam at the Old House Parts Company in Kennebunk. The newel post, which drove the stairway design, was a gift from Charlie’s uncle, who rescued it 50 years ago from a demolished Prouts Neck hotel. Nominate your home for a feature!